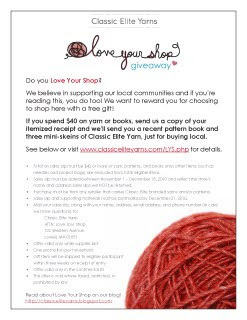 Classic Elite Yarns: Love Your Shop Giveaway! Woo hoo! I printed out the flyer and will be telling my customers about it. I JUST TODAY SPENT $50.50 lol at the Fiber Factory (Owner Terri) I'm Calling Her tomorrow & Telling Her about it So She Can Print a Flyer for her other Customers !!!! Very Nice love love CE Yarns Just Bought Jil Eaton Last WeeK !!! Gorgeousss Lavender I'm Gifting Out with Needles to My Kp Community gal pals In SAL !!!! You are amazing. I am blown away by this creative and generous offer. I am visiting a favorite LYS today to be sure they are aware of this promotion. You should be receiving my receipt soon! A question: does the total have to be on one receipt from one visit to the shop, or can we combine several? Hi AndyMeg! The rules do not require that the $40 be on one receipt only. I shop at my LYS but most of my purchases are done on their online store since their hours conflict with my work schedule. Does a confirmation email with my purchase count? The document you submit must be a receipt, so a confirmation email unfortunately wouldn't be quite the same. Also, please make sure it has the store name and address on it! What a great idea! Too bad it's not available in Canada; I'd go there straight from work. :) Thanks for supporting local shops! Do the yarn and books need to Classic Elite items or do any yarn and books quality? The post does not specify that it has to be CEY yarn. Can it be ANY purchase from a local shop, or does it have to be CEY products? I'd love to participate since I love my LYS which started off small but with a lovely selection of yarns has been able to build up the business and is is still growing. Unfortunately I can't participate since there is no yarn shop in France selling Classic Elite ! We love it when you buy our stuff, but this offer is a thank you to our local shops and applies to all yarn and books! Great, huh? Several members on other groups are upset that this is continental US and does not include Alaska and Hawaii... is there a reason they were excluded. While we would love to include everyone in our promotion to support all LYSs, we have limitations due to prohibitive shipping costs outside the continental US. In spite of these limits, we hope you will continue to support all local yarn shops, no matter the geography. Wonderful promotion - I have a question - I have a receipt from my LYS for $42.00 but I had a store credit for part of that purchase and also a frequent buyer voucher for part of the purchase. Will this qualify? As long as you're buying yarn and books from your local shop, it doesn't matter how you pay! I bought yarn at my LYS yesterday...one of the two in town who sell some Classic Elite...but the receipt isn't itemized. Will it still work? She just gave me the one the copy from the credit card machine. I'm there most Saturdays, so I think she figured she'd remember what I got! Because this promotion applies to specific purchases, the receipt must be itemized. Do you think she can give you one? Too bad it is not valid for Canada. I looooove CE yarn and my LYS carries some of it. I bought yarn at my LYS, and the total came out to be 42.84. However, without tax, it's 39.90. Is there any way I could still be eligible? My local yarn store closed over a year ago :( So now I shop at A.C. Moore, that's the closest to me, does that count?? Bettina, $39.90 is close enough. Thanks! Amgoth2000, the rule regarding shops is that the store must be a CEY retailer to qualify. Emy, I'm sorry to hear that a listed shop has since closed! That makes this promotion seem all the more important, support your local shops everyone! It looks like our online list needs to be updated, but if your shop buys Classic Elite yarn from us, then we definitely have a record of it, so it counts. St. Denis yarns also count, as they're distributed by Classic Elite. Books and patterns are valid purchases, so I would say magazines are valid. I'm a magazine junkie myself. Phew! Thanks for the questions everyone. Keep those receipts coming! Thank you! what a generous offer. I'm on my way to my LYS soon. Yay! I got that itemized receipt for last week today...but it doesn't matter because I spent another $50 today for small business day...and cuz I'm an addict! :) I'll be sending one of the receipts in on Monday. Thanks again for doing this!!! We shop at several LYS(s)to try and keep them all going in our area. Can receipts from 2 different stores count if they add up to over $40.00 for yarn and books or do the receipts need to be from one store? What a nice idea! I just bought a pattern book and yarn for a sweater from Strands Studio in San Clemente, CA but alas they are not a retailer :( I love the LYS experience and thank you for supporting them!!! I also have a question -- I have a receipt for $48 (pre-tax) from a participating LYS (A Verb for Keeping Warm in Oakland, CA), but I paid for the items with a gift card I had purchased from them earlier, so the total paid at the bottom of the receipt says $0. Can I use this receipt with maybe an explanatory letter or something with it?